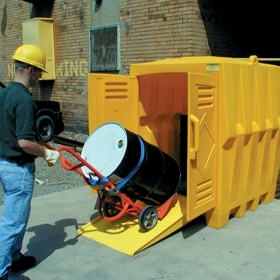 Contain overflow and leakage from cans, drums and other containers. 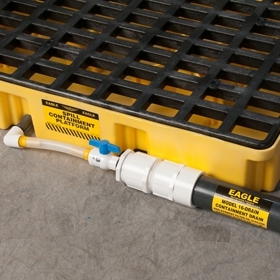 Manufactured from High Density Polyethylene (HDPE), Eagle Spill products will not dent or rust and provide high load capacities. HDPE is a strong stable material that is compatible with a wide range of chemicals. 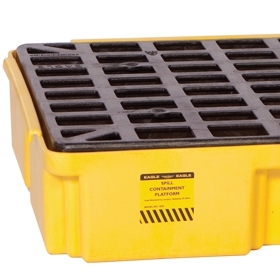 Most Spill pallets and Spill Containment platforms feature removable grates for easy cleaning and comply with EPA SPCC regulations. Model's 1633, 1634, 1635, 1647, 1686, and 1688 and the Model 1689 ramp are parts of the Eagle Modular Platform System. Each part can be interconnected with a built in U-Channel. Mix and match pieces to custom build a containment system to best fit your facility. 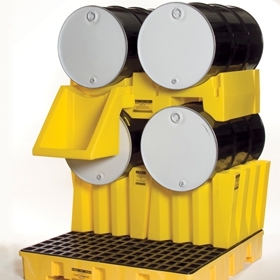 Need to store drums on their sides? Add Horizontal Drum Cradles and Stackers for increased flexibility. 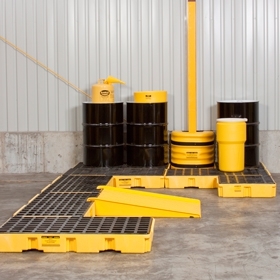 Spill pallets offer increased sump capacity and are easily moved by forklift. 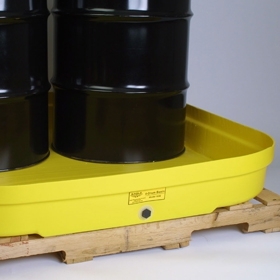 IBC units offer even greater capacity and are engineered to support large chemical totes with weights up to 10,000 lbs. Need secure covered storage? Covered workstations, roll top units and poly storage buildings give you lockable storage that can stand up to being outdoors.